IKEA high chairs have been recalled as the restraint buckle can open unexpectedly, posing a fall hazard to the child. The recall affects about 169,000 ANTILOP High Chairs, sold in red, blue or white. 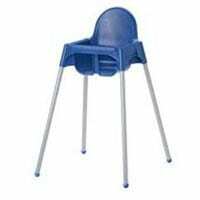 The plastic high chair has detachable silver-colored metal legs. The model number is on a label affixed to the underside of the seat. Model numbers included in the recall are: 701.467.92, 501.467.93 and 300.697.24. The chairs were sold in IKEA stores nationwide from August 2006 through January 2010 for about $20. Consumers should immediately stop using the high chairs and contact IKEA to obtain a free replacement seat restraint on (866) 966-4532, or visit www.ikea-usa.com.